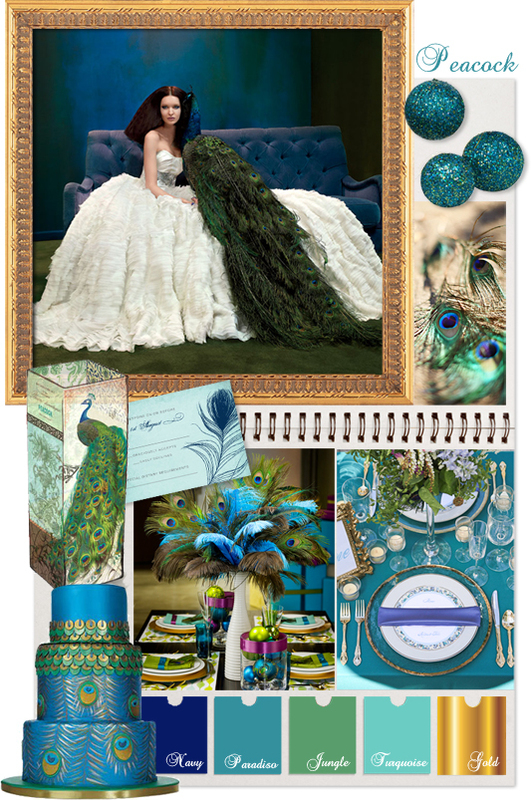 There's a reason peacock themed parties are so popular, the rich palette of jeweled colours, the glamour and opulence. 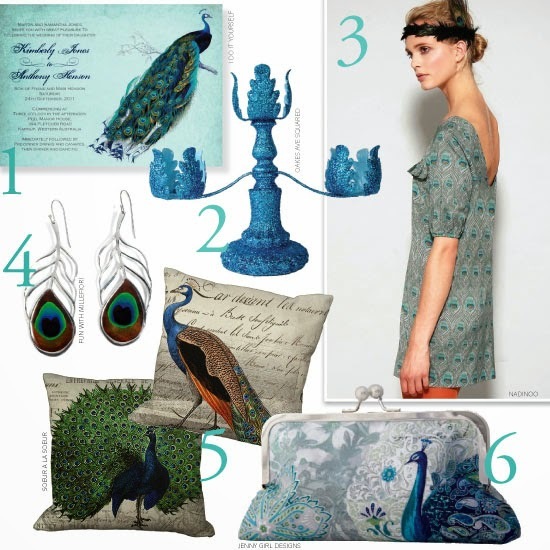 Strut your tail feathers because this month on the blog it's peacock party time! Credits: Three-piece bridal set by Lela Rose, photo by Cleo Sullivan for BRIDES Magazine, glitter ball ornaments, peacock feathers by Katelyn James. Glass peacock vase from Fringe Studio, vintage peacock rsvp from 'i do' it yourself. Peacock cake via Brides. Peacock inspired party setting via Hostess with the Mostess. Turquoise place setting via The Wedding Chicks. Colour palette: navy blue, jungle green, gold, paradiso and turquoise. 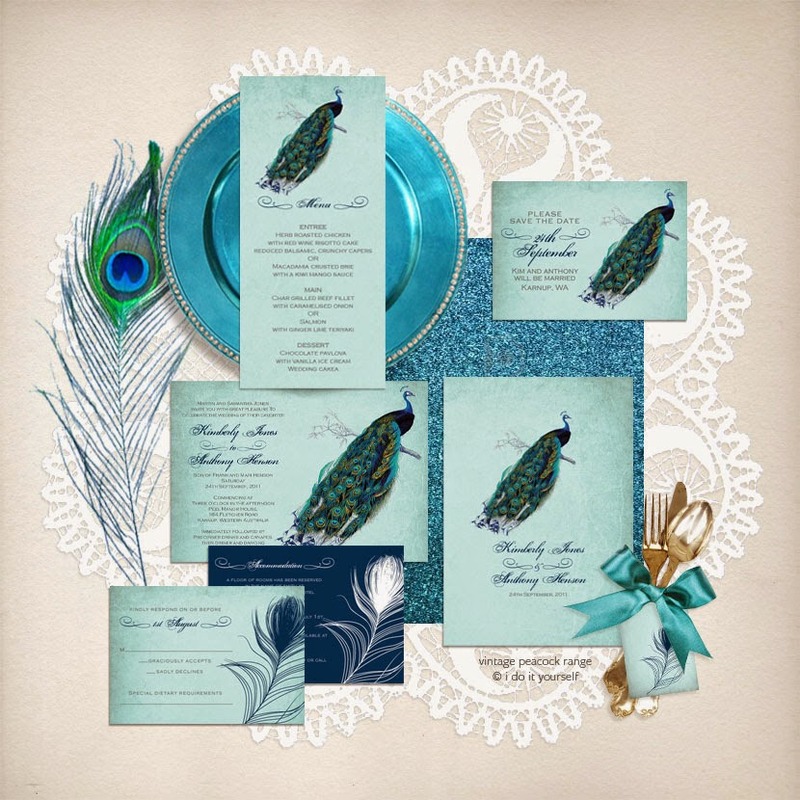 With a beautiful vintage peacock illustration and pretty peacock feather, this ﻿printable wedding stationery suite sets the scene for a glamorous affair. With pretty fonts and an aged paper effect which is even part of the file - no special paper required. Shown here cruise, navy and dark grey or pick your own colours from our options. Available from our online shop i do it yourself. Another great way to incorporate the peacock theme into your wedding is with a very unique guest book idea. 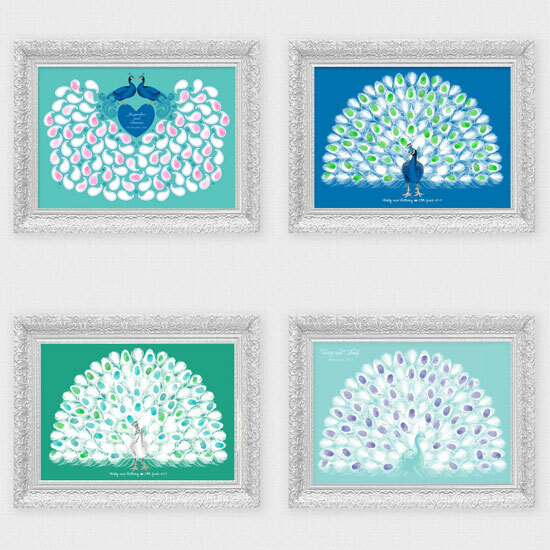 These beautiful fingerprint or signature peacock guest books come in four different styles. Available from i do it yourself. Peacock feathers can be incredibly beautiful and it's tempting to use them in just about everything, from a single feather sent out with your invitation and peacock accessories, to the bouquet, floral arrangements and table decorations. But how have the feathers been sourced, what happened to the peacock? Obviously the most environmentally friendly and ethical way to source any feather is to pick it up off the ground. Firstly, you'll need to clean and sanitise it, (something we'll look at in another post) but when you're talking about peacocks, just finding one lying around outside your house isn't very likely. Male peacocks do naturally shed their beautiful tail feathers annually in the autumn, and ethical peacock feathers come from farms where feathers really have just been collected from the ground. Ask your supplier to source you cruelty free feathers, or if you are searching for them yourself a good tip is to look for feathers with their entire shaft intact. Large scale harvested feathers are often chopped or pulled right off the bird before it's ready to fall, so the end will be cut off to hide the damage. A naturally dropped feather tapers to a point with a tiny hole in the centre where the blood vessel used to be. 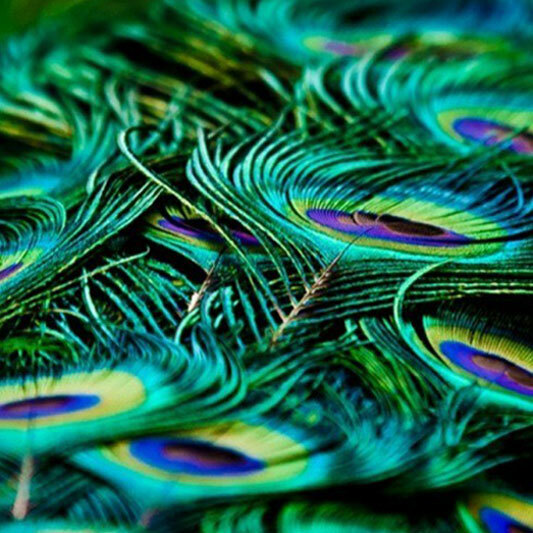 Ethically sourced peacock feathers may be harder to come by in huge quantities. Later this month we'll take a look at a few alternatives so you can save the humane ones for the really special details. If you have any tips to share on sourcing ethical feathers please do leave a comment.